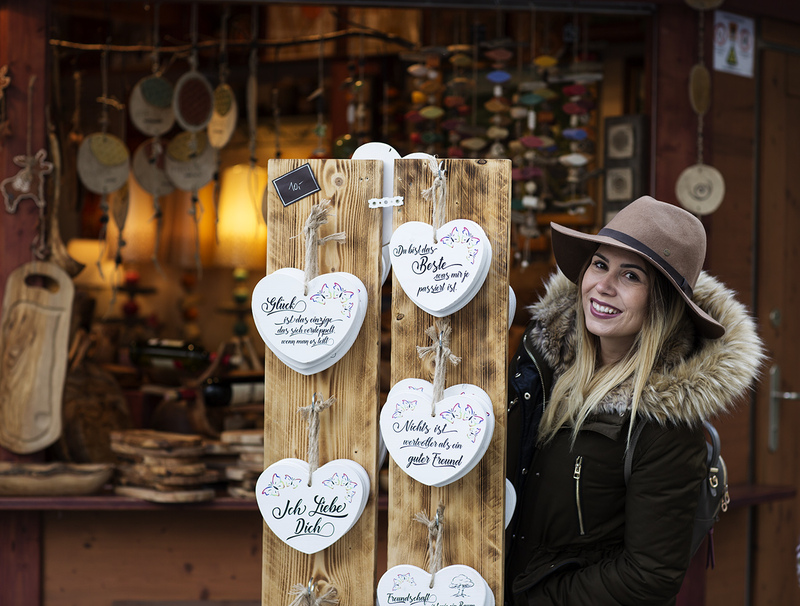 Last weekend we were on a special mission powered by Linz Tourismus – to explore Linz and its Christmas markets! 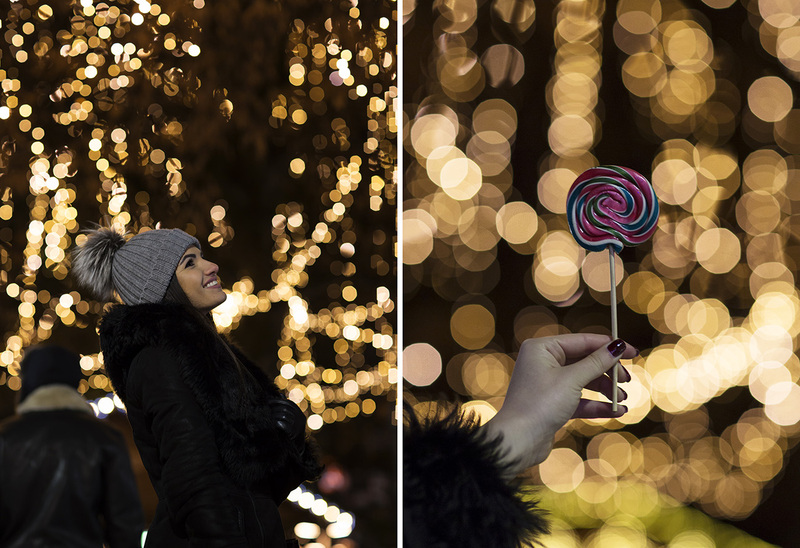 Mingling around, discovering the city on a chilly weather, tasting all those delicious treats and drinks was not an easy job, but someone had to do it. 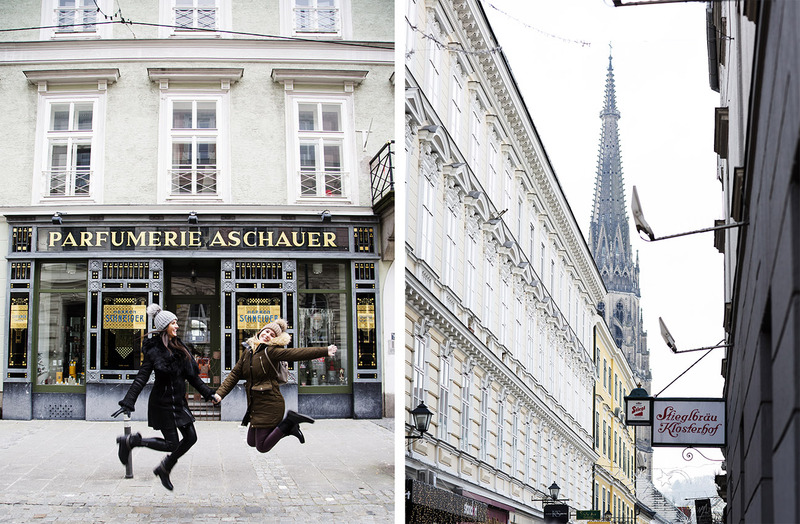 😀 And we brought our dear friends and Vienna Insider team members Alex and Anja to join us on this adventure! 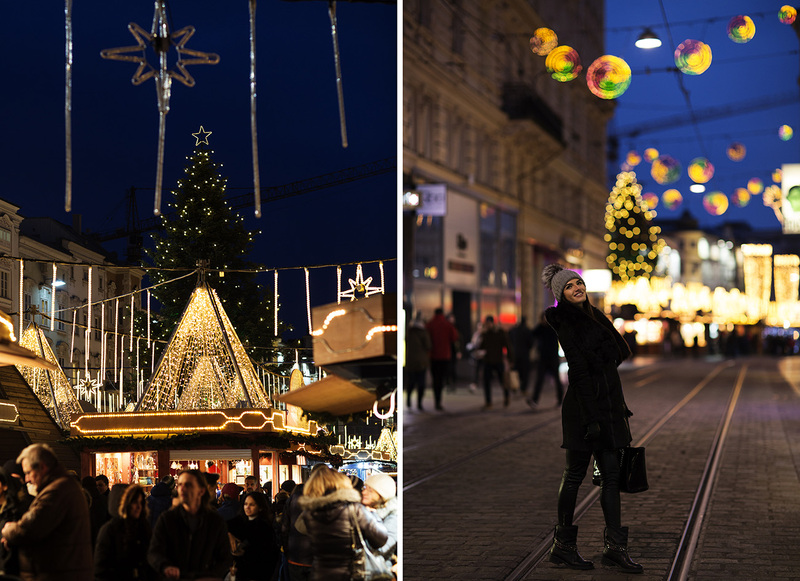 Stay tuned and let us show you why you shouldn’t miss Christmas in Linz! 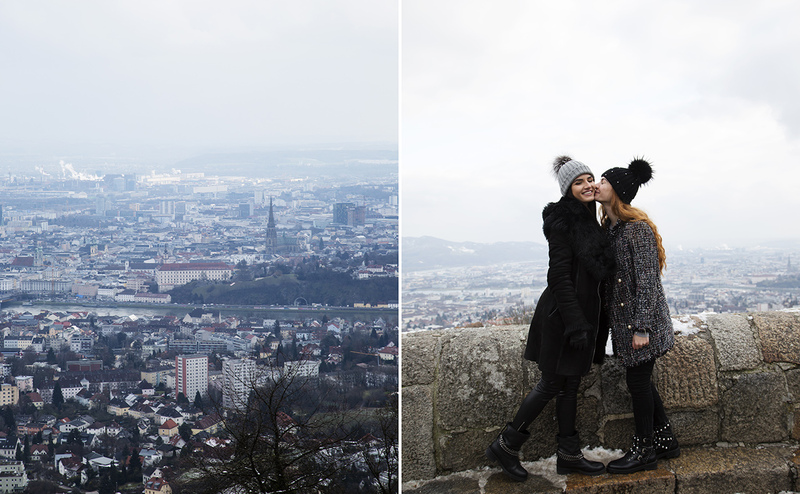 It took us two hours to get to Linz from Vienna by car and we spent the whole day getting to know the city and testing the Christmas markets. We were delighted to discover how many events are organized in Linz during this time of the year, as well as with their sightseeing offer in general. 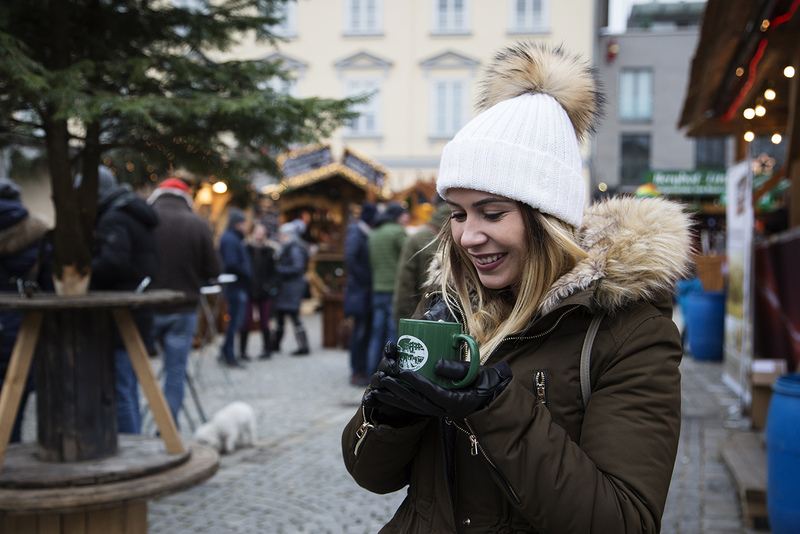 Before moving on to our little Linz Christmas markets guide, we would like to say that what we loved the most about them in general was that they were less commercial, more authentic and with a more relaxed atmosphere. Last but not the least – the prices were quite lower than in Vienna. The post is divided in two parts, first being the Xmas markets guide, and the second our general top 5 tips for Linz. 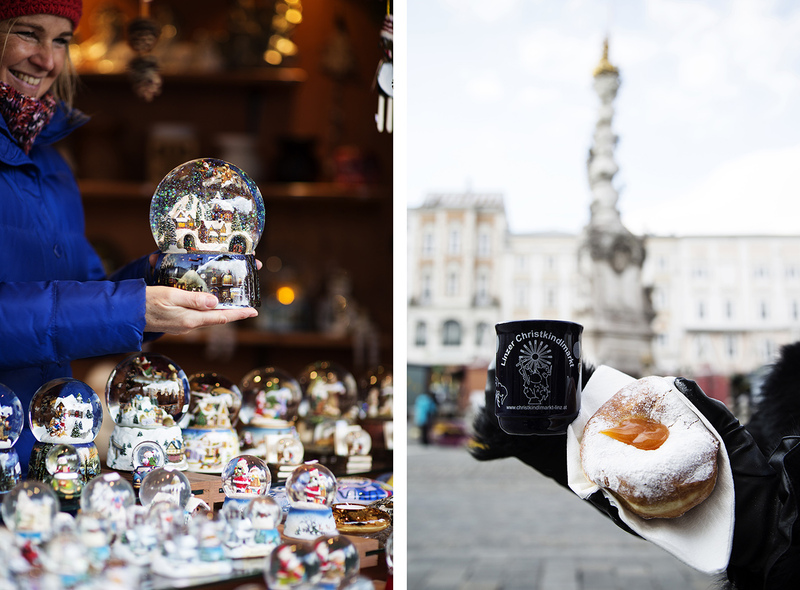 We started out Christmas market tour in the heart of Linz, at historic Hauptplatz, with a glass of warm punch and freshly baked Bauernkrapfen. This delicious Austrian style doughnut is a must try, so please forget about calories and going gluten free for at least a day. 🙂 The architecture of the main square is gorgeous, it is a perfect starting point for exploring Linz and of course for taking pictures! We recommend you to stop by this market while there is still daylight, but also once it gets dark to get a glimpse of the festive atmosphere when the lights are on. This market is so beautifully decorated, in visual terms this was the one we loved the most. Must-try: Bauernkrapfen with apricot marmelade; melted Raclette on a piece of dark Austrian bread, crispy Langos (a sort of fried garlic pastry, so so good) and Nutella covered almonds (or many other delish nutty creations sold at several stands). 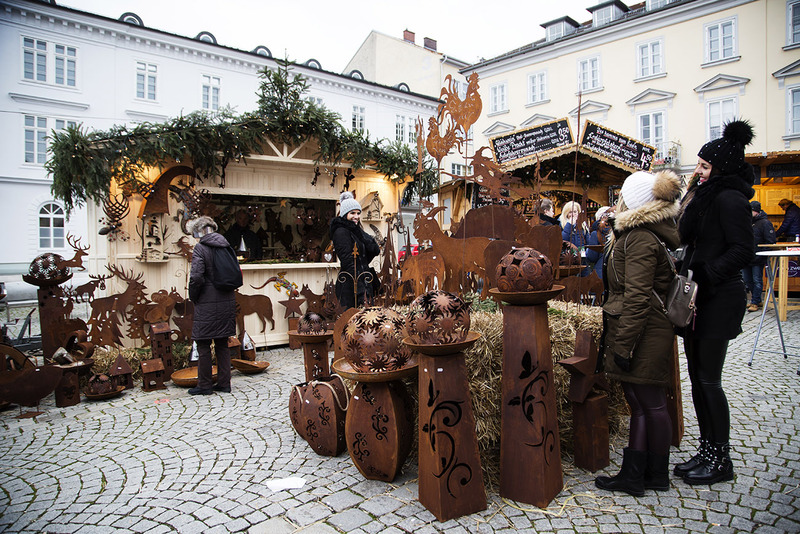 Shopping tips: In our opinion Christmas market at Hauptplatz was the best for shopping. We spotted gorgeous snow globes, framed calligraphy quotes, dishes made of olive tree, as well as gorgeous hand painted glass ornaments. There were really many nice things to find at this market, and the best of all is that they really didn’t seem commercial. Most stands had handmade, unique items on sale, which is something we personally appreciate. If you are into organic, bio diet and lifestyle, the winter market at Pfarrplatz will be a true heaven for you! Centrally located, basically behind the main square, is cute Pfrarrplatz with smaller market full of stands offering food and drink made of exclusively organic products. 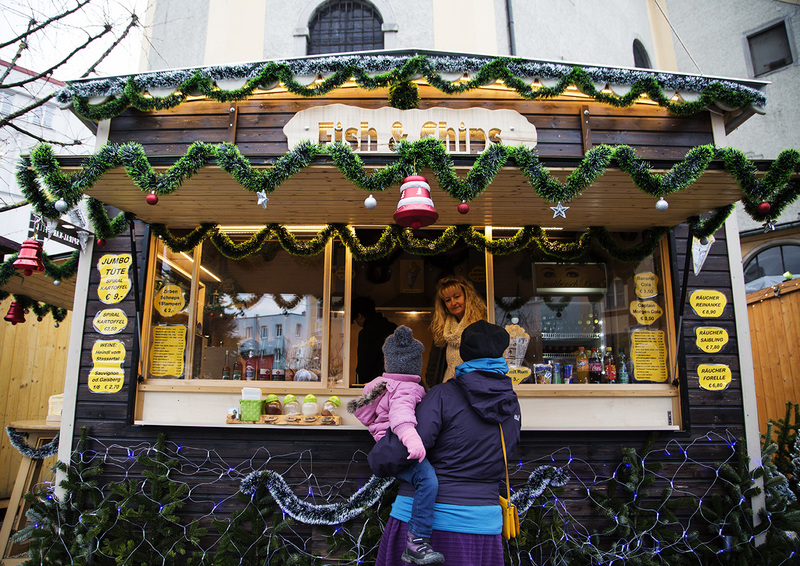 Be it thanks to the high quality ingredients, or maybe lots of great recipes, the food and drinks we tried at winter market at Pfarrplatz were our favorite. Also the atmosphere was very pleasant and festive, we loved this market a lot! Must try: Red Berry Punch at the stand you see down below. This was by far the best punch of our lives! And it was even approved by our friend Alex, who is a true punch pro. It had such intensive berry taste, good amount of sugar, as well as fair amount of rum and spices. It tasted like true Xmas! Besides the punch, we also tried here tasty mulled wine, chimney cakes and roasted chestnuts. They even had a stand with fish and chips, which so far we haven’t seen anywhere! Shopping tips: Check the stand selling handmade clothing items made of wool and many other selling handmade or organic products. Must-try: Bauernkrapfen – once again! We actually loved these more than the ones we had first in the morning on Hauptplatz, because they were more fluffy. Other than that, from savory things we loved baguettes with different toppings the most. Roasted sausages with cabbage were quite good (even for no sausage fans like us), and roasted potatoes with different sauces. 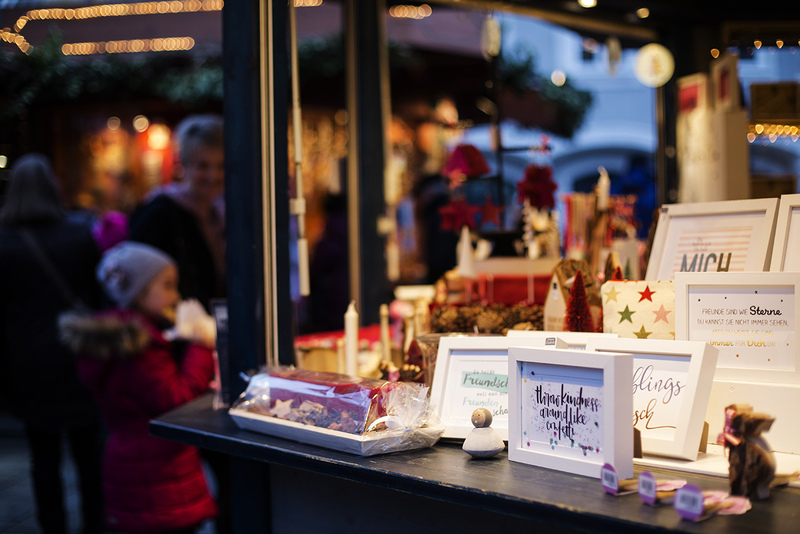 Shopping tips: Christmas market at Volksgarten is a great choice for commercial shoppers. There are stands with candies, clothes, candles, ornaments, souvenirs, etc. But among those we also noticed a stand with murano glas ornaments, another one with warm slippers and other items lined with wool, and a few other cool stands that we haven’t seen on the previous two markets. 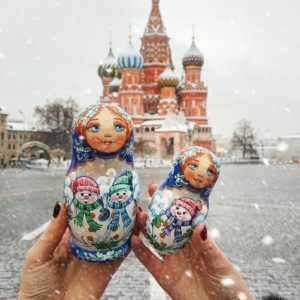 That would be it when it comes to our tips regarding Christmas markets, but there are still a few things that we would like to share with you. Did you know that Linzer Torte is considered to be the oldest known cake in the world? 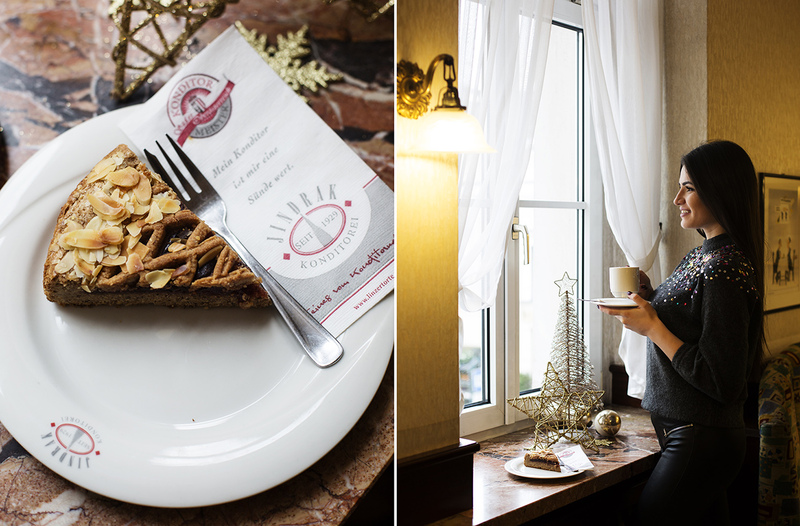 There is not a better place than Konditorei Jindrak, known as the “Home of Linzer Torte” to indulge in this simple and yet such a tasty cake. We went to their head office in Herrenstrasse 22, just a few minutes away from the Hauptplatz. 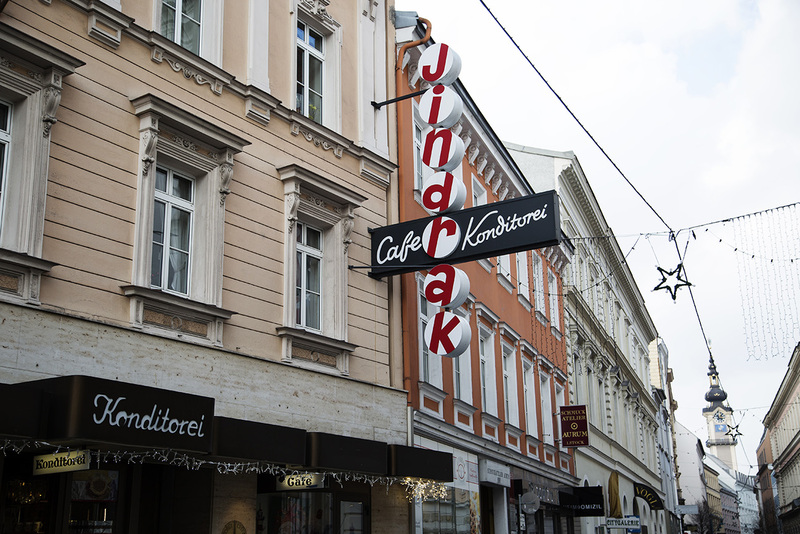 Next door is also Jindrak shop, where you can purchase Linzer Torte as a souvenir, along with many other sweet goodies. What we absolutely loved about Konditorei Jindrak was the super friendly service and we must say that their cakes exceeded all our expectations. We are talking here about a genuine, Austrian old school, great quality patisserie, full of locals. Besides Linzer, we also had Chestnut cake and Chocolate Truffel cake (this was our top favorite, but also chestnut was spot on!). 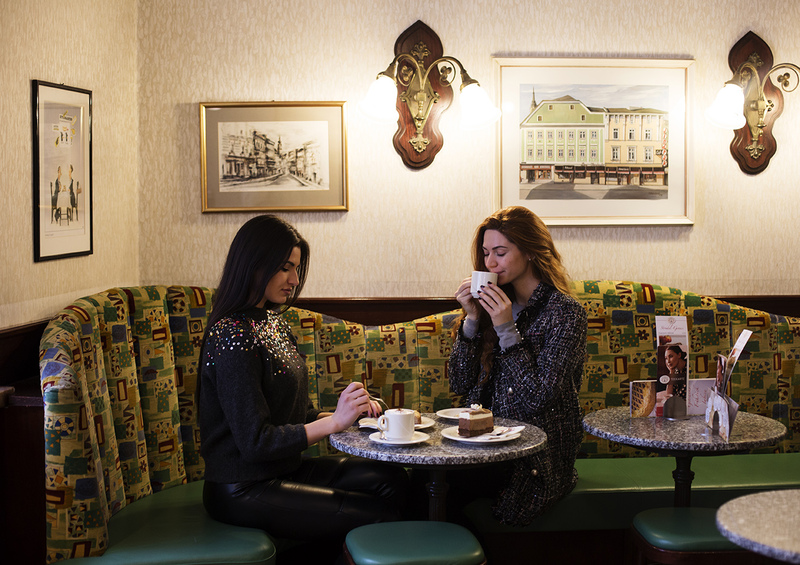 Long story short – it would be a total sin to miss warming up with a cup of tea and a piece of cake at Konditorei Jindrak when visiting Linz! Hop on Pöstlingbergbahn right at Hauptplatz (main square) and after 20 minutes ride through the city, you will reach the top of Pöstlingberg, Linz’s local mountain. The view from the top is gorgeous! You will not only see the entire Linz, but even parts of the Czech Republic! How cool is that? The ride itself has a vintage vibe, and once you reach the top you can explore Pöstlingberg, take beautiful pictures, visit the little church, have a piece of cake at Konditorei Jindrak (they have a branch up there) or explore some other restaurants. If you are coming with kids, make sure to check fairy tale world called Grottenbahn (Grotto Railway). The Ars Electronica Center is a perfect place for having fun while learning many cool things by experimenting on your own. It is located at the Danube, with beautiful views stretching over Linz and it contributed to Linz becoming UNESCO city of media arts. Unfortunately our schedule was packed, so we had no time to personally check Ars Electronica Center, as our priority this time were Xmas markets. But we definitely plan to do this first upon our next visit to Linz. We really love hands on museums! 4. Get inspired and shop for unique goodies in Linz’s numerous concept stores, and don’t miss checking cool coffee places. You will find exactly what you might be interested in, by looking at the link here. 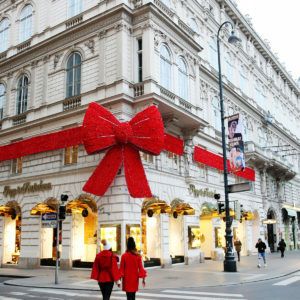 And for more information about shopping in Linz, click here. 5. Go for a stroll and explore all those photogenic, narrow streets of the historic city center. This always make us create a special bond and make unique memories of the city we are visiting, because you stumble upon lovely corners that haven’t been mentioned in any tourist guide. 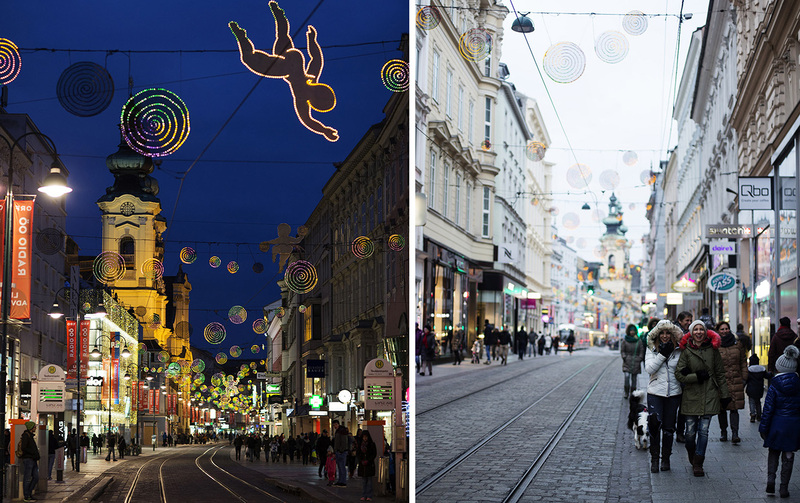 Linz enchanted us with its architecture, Christmas spirit, flavors, modern vibes and above all, its friendly people! We are sincerely hoping that this article will inspire you to embark on your own Linz adventure! Visiting Linz is a perfect choice for daily or weekend trip, when you simply need some relaxation from our always dear, but crowded Vienna. Gather your favorite people, hop on a train, or car together and in only two hours you will already be exploring the gorgeous streets of Linz with the scent of cinnamon! 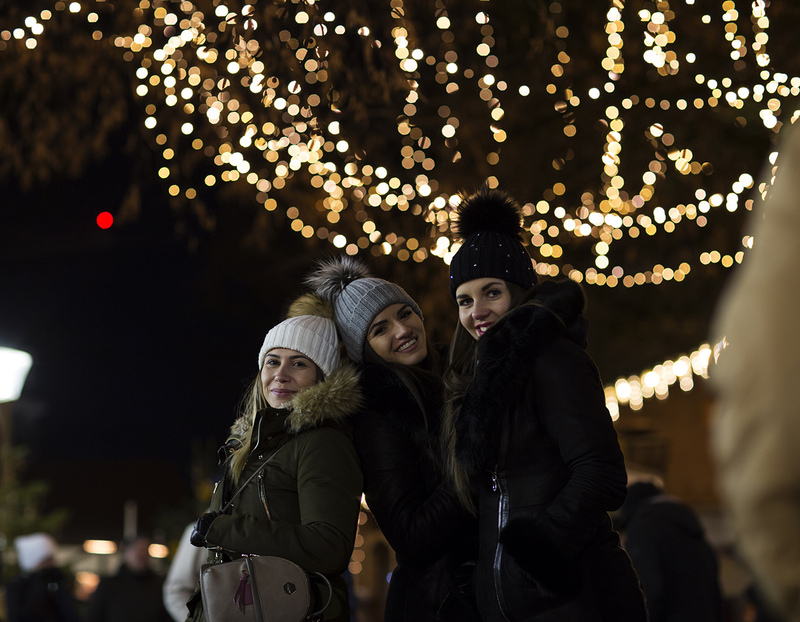 And one last tip – make sure to check the link here before your trip, for ongoing information about Christmas related events in Linz. And before we say goodbye we would like to thank Linz Tourismus for inviting us to take part in this project. We enjoyed so much and are already looking forward to visiting Linz again! There is still a lot more left to explore and learn about this gorgeous city. 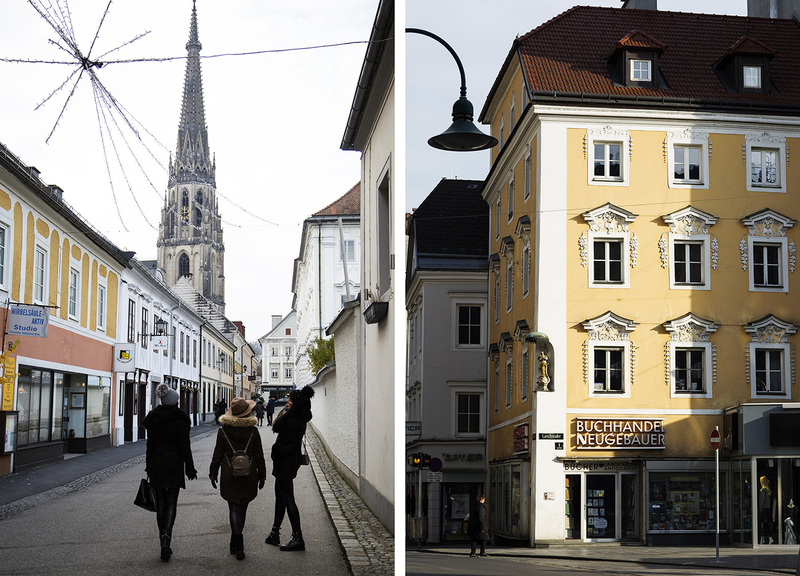 This post was done in a friendly collaboration with Linz Tourismus.